Approximately 3,000 children in Dallas go to sleep each night without a home of their own. 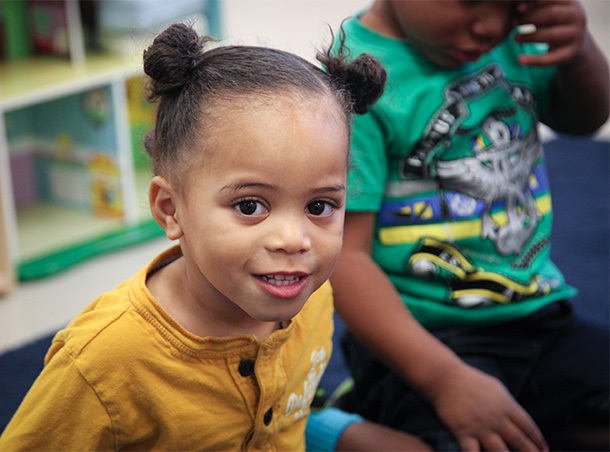 We’re on a mission to help young children overcome the lasting and traumatic effects of homelessness. It is our vision that every child in our community has a home, a self-sufficient family and a foundation for success in school and life — and the clock is ticking. 90% of brain development happens by the age of five. Without intervention at this critical time, homeless children may suffer lifelong social, emotional and educational deficits. That’s where we come in. And YOU can help. With the 6th largest GDP of any American city, major cultural and sports programs, renowned medical centers and universities and more than 20 Fortune 500 company headquarters, Dallas is a thriving city with much to offer. However, Dallas also has the one of the highest child poverty rates in the country among cities with more than 1 million people. 30% of Dallas children grow up in poverty, or two of every five children. That means 3,000 kids in our city are currently experiencing homelessness. Homeless children are the most invisible and neglected members of our community. But Vogel Alcove is devoted to helping these children cope with the physical, emotional and mental trauma they are experiencing so that they might succeed in life despite their circumstances.